Now a prison ship lies waiting in the[D] bay. It's so lonely round the fields of Athen[D]ry. Now you must rase our child with dignity. E major using the chords here. The Irish soccer / football team supporters also use the song as a ''chant'' when the national team are playing. Unfortunately they only seem to know the first verse and chorus. They also change some of the words and the timing. Also used by the rugby supporters to give the team a bit of a lift. How To Play The Fields Of Anthery On Guitar. These are the basic chords and the strumming pattern to play the song in te key of D Major. Joe Duffy - When did you write the fields of Athenry ?. Reilly coming out to do some gigs with us in The States. 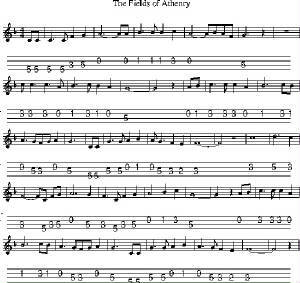 going to sing The Fields Of Athenry as my final song. 'Reilly did and how many years ago is that. took of and we have it today as a kind of peranual. to sing it acapella out in the middle of the pitch. audence sang the rest. It was quiet a moment. Joe Duffy - And how long did it take you to write it ? at the area and Athenry was the place I choose. at the time but now there are bus tours. invited me down to give me the mace and chain. you just picked it because you saw it on the way back. Now a prison ship lies waiting in the[G] bay. It's so lonely round the fields of Athen[G]ry.